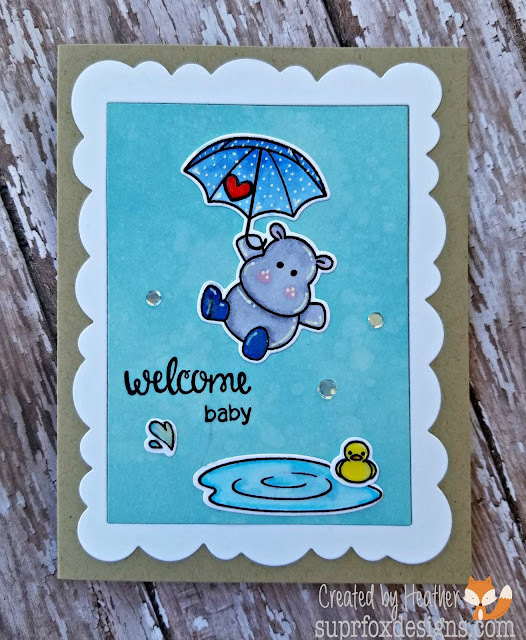 I am back to share this baby shower card I made for my eldest son and his wife who are expecting their first baby soon and I used the absolutely adorable Rainy Day Play stamps and dies from Clearly Besotted. I started by using my Distress Oxide Ink in Broken China on a piece of Neenah Solar White 80# card stock then sprinkled some clear water on and blotted off, when dry I cut it out using the Wonky Scalloped Frames from Avery Elle. 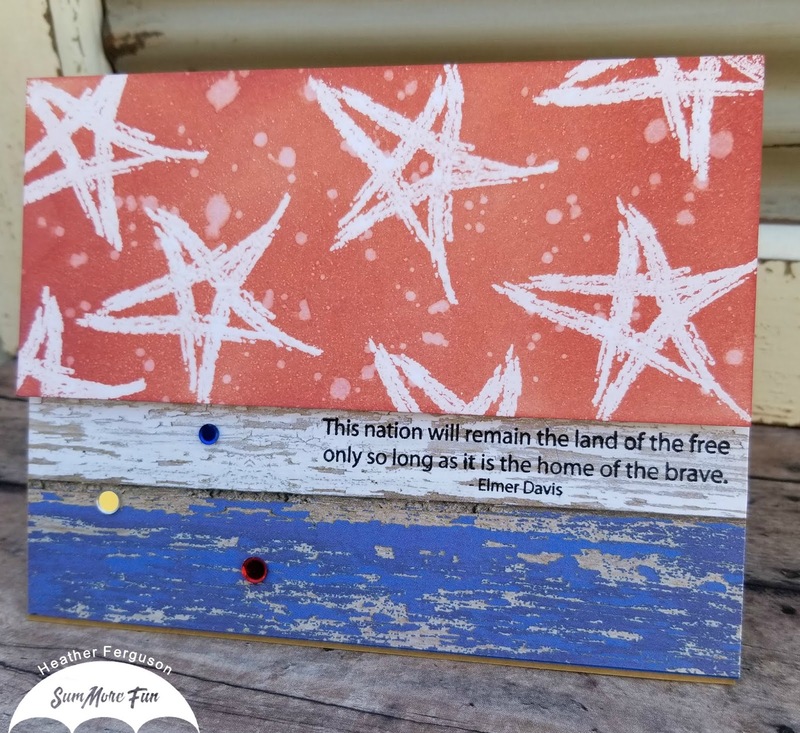 I set this panel aside and then cut a piece of Neenah Solar White 80# card stock with the same die for the outside frame. 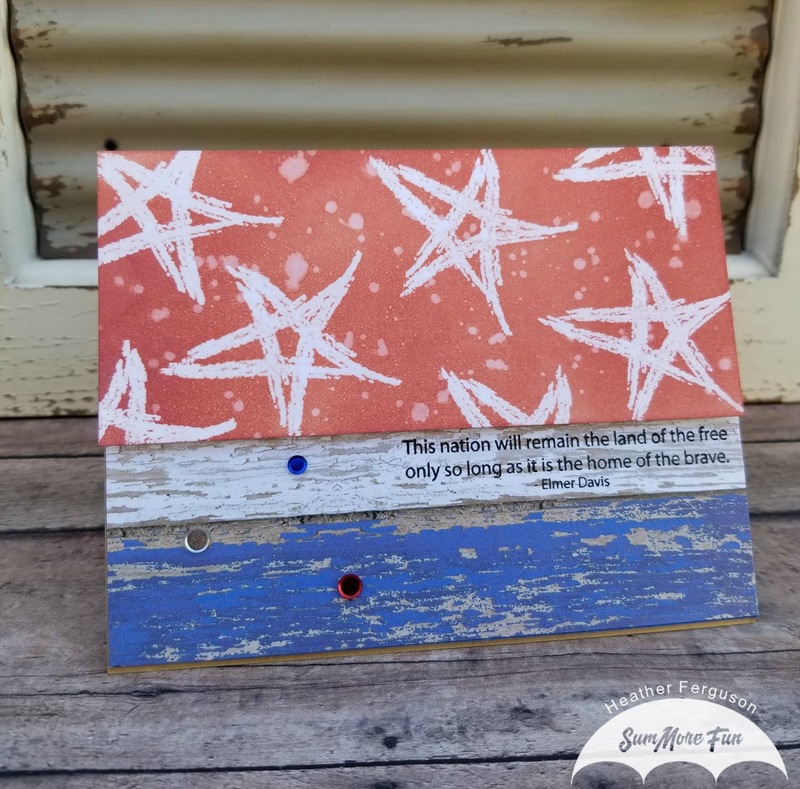 I then took a piece of Neenah Desert Storm card stock and made an A2 sized side fold card base, I then glued down the frame and inked panel to the card base and set aside to work on the elements. I colored the hippo and his umbrella, water puddle, splash and ducky with my Copics and then glued them on my panel. I used the "Welcome Baby" sentiment from Newton's Nook Loveable Laundry set and stamped in Versafine Black Onyx ink on the front of my panel. I then used my white gel pen for accents on all the elements and my Spectrum Noir Glitter Gloss Pen on the umbrella, puddle, heart and splash, then used Glossy Accents on the heart, splash and ducky. I finished my card with some clear confetti sequins from Unity Stamps. And that is all for this card. So I know it has been a while since I have posted but I am back. Life happens and wow has it been a busy few months. 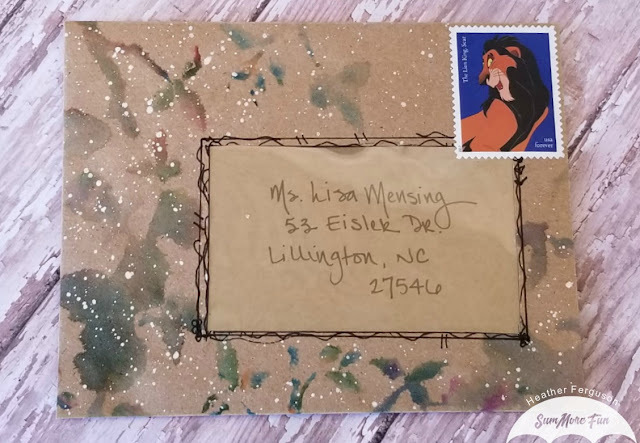 I do have a card and it will post shortly and I think it is a fabulous return for my crafty blog. I will try to post a little more frequently then I have recently, but it will still be a bit hit and miss for a while. 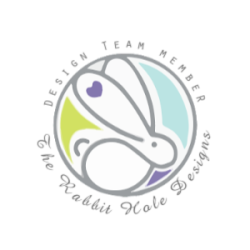 My folks are currently living with us as they prepare to move to a new state and personally our family business is changing and growing and taking up quite a bit of extra time. Also, I wanted to personally write and say that I absolutely loved being on the SumMore Fun Design Team, but my time there is over, it was fun and I have learned so much and stepped out of my comfort zone by being on the DT and so I am sending a huge thank you to SumMore Fun for having me. So having said that, enjoy my upcoming post and I will see you all soon! 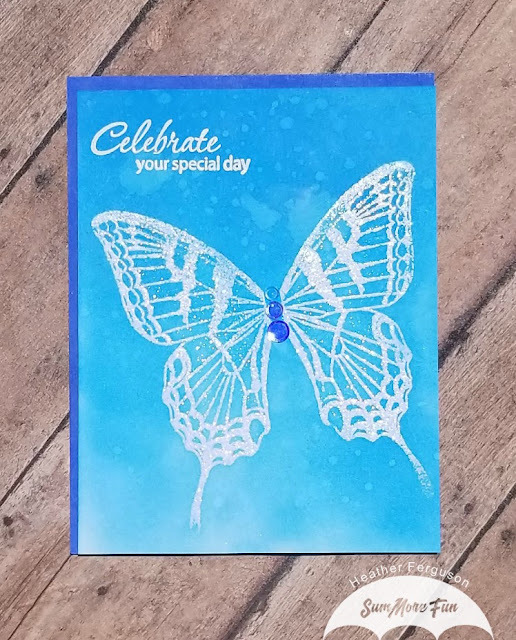 For my card today I started with a piece on Neenah Solar White 110# card stock cut to 4"x 5 1/4" and stamped the Butterfly (1594-B) from Victorine Originals in Versamark Ink then heat embossed using Ranger Holographic Embossing Powder. I then used Ranger Distress Oxide Ink in Salty Ocean and blended from the top of the card stock downwards to get a slight ombre blend. 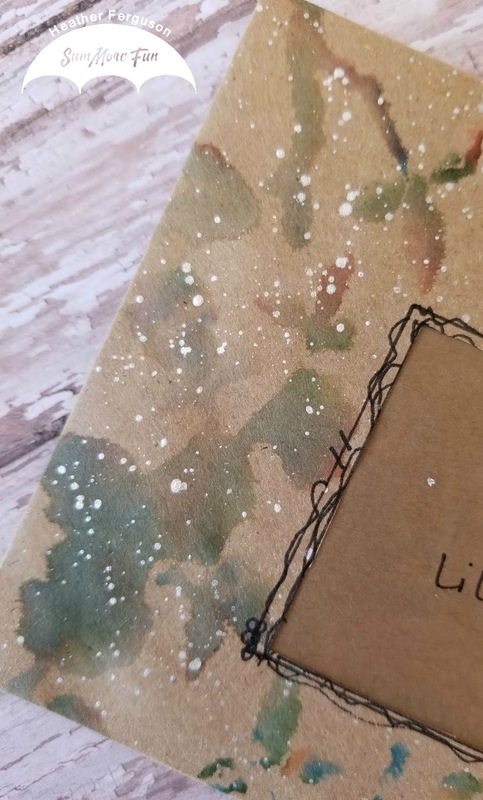 I spritzed my paper with water and let sit to dry while I worked on the rest of the card. I then took a piece of Neenah Solar White 110# card stock cut to 4 1/4" x 5 1/2" and swiped Ranger Distress Oxide Ink in Blueprint Sketch around the edges. I then taped this piece direct to a side folding A2 sized white card base. 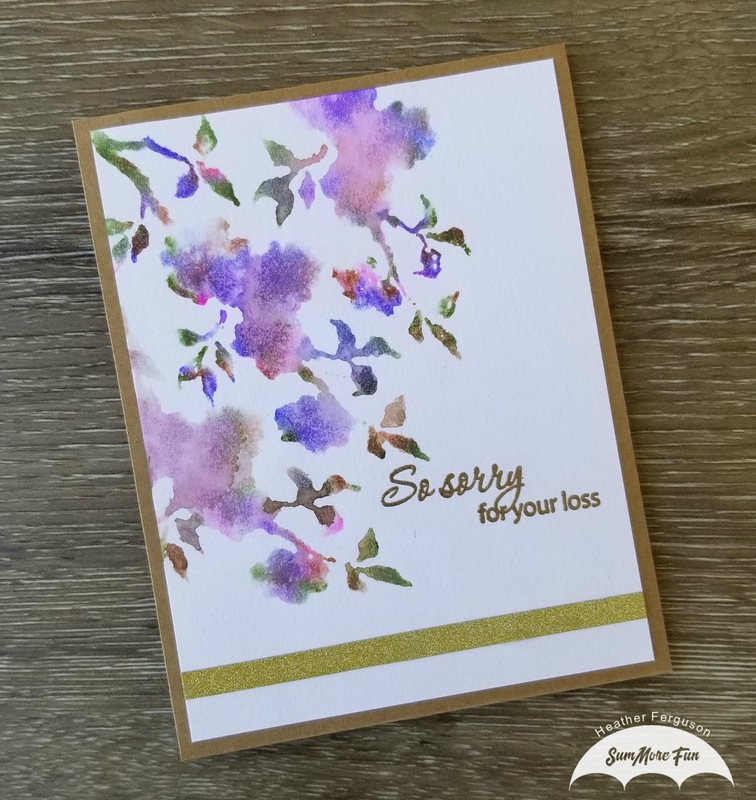 I then stamped my sentiment from Raisin Boat's Flourishing Thoughts stamp set (10271) in Versamark Ink and heat set with Nuvo Fine Detail Embossing Powder in Glacier White on my top design so I could add fun foam to the back to pop it off the card. 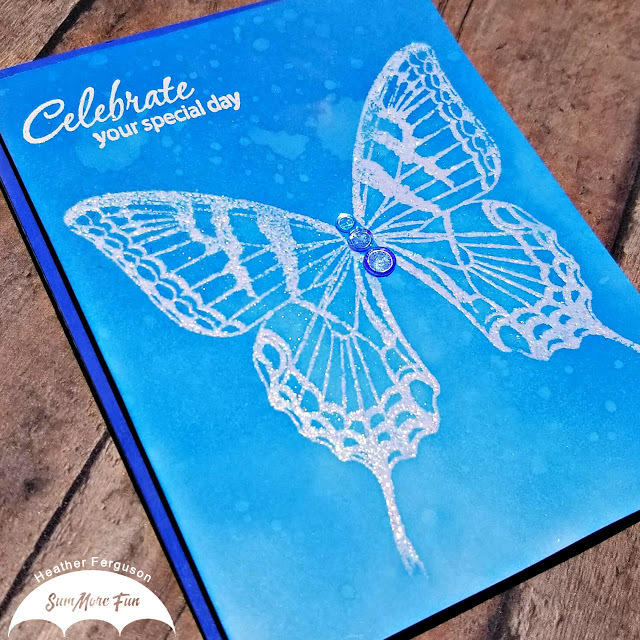 To finish off my card front I added some Iridescent Confetti Sequins to make the body for my butterfly. I then added my fun foam and popped the top layer off the card leaving a small border on the top and left side of the card for interest. I finished the card off by adding Wink of Stella to the butterfly wings for more sparkle. 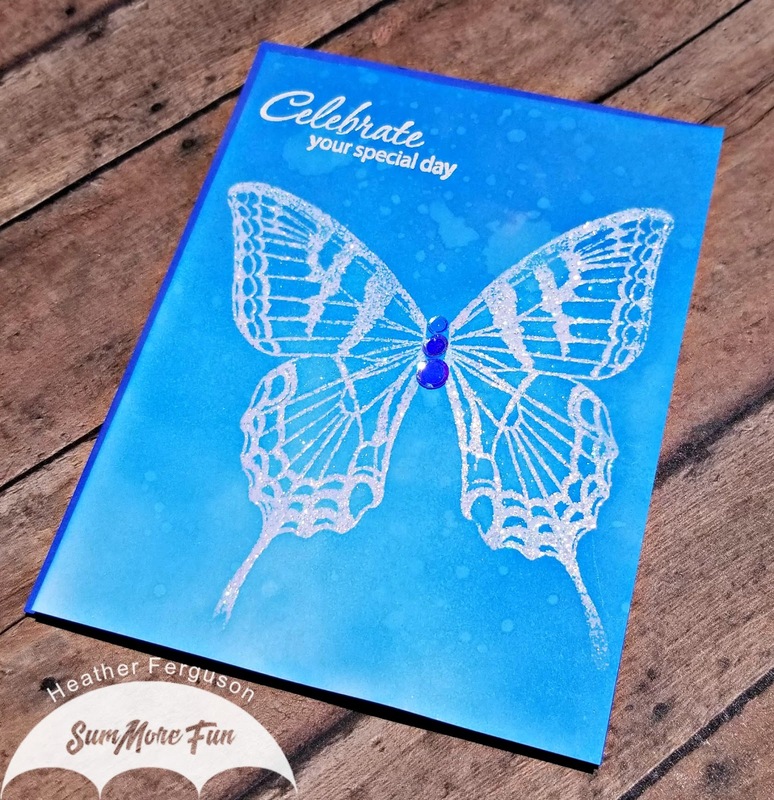 It is my day to take over the blog at SumMore Fun (Victorine Originals) and I am always in need of birthday cards, but this would have also made a super cute wedding shower card. I started with an A2 card base in Kraft and then cut a large banner out of some cute Kraft paper with pink polka dots from my crafty stash, I then cut out a circle in the middle of the banner . I stamped a sentiment from the Raisin Boat Stamp Set Flourishing Thoughts (10271-Z) at the bottom of the banner. I added some twine with a small bow at the top and then popped the banner up with some foam tape on the card base. 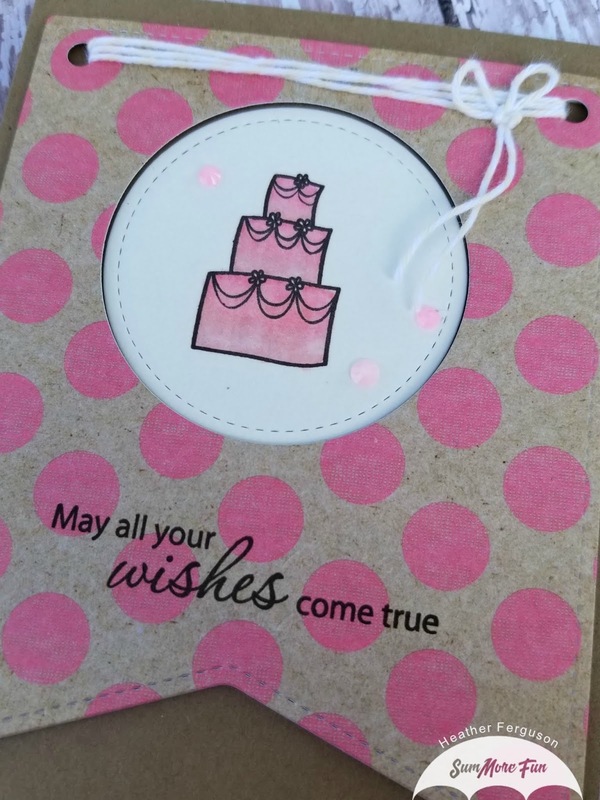 I then cut a circle out of Ivory card stock and stamped the super cute cake stamp from the Raisin Boat Stamp Set Off To Party - Old Design (10003-Z) and then used some pink Copic markers and colored in the cake and topped it off with some Nuvo Clear Glitter Gloss. 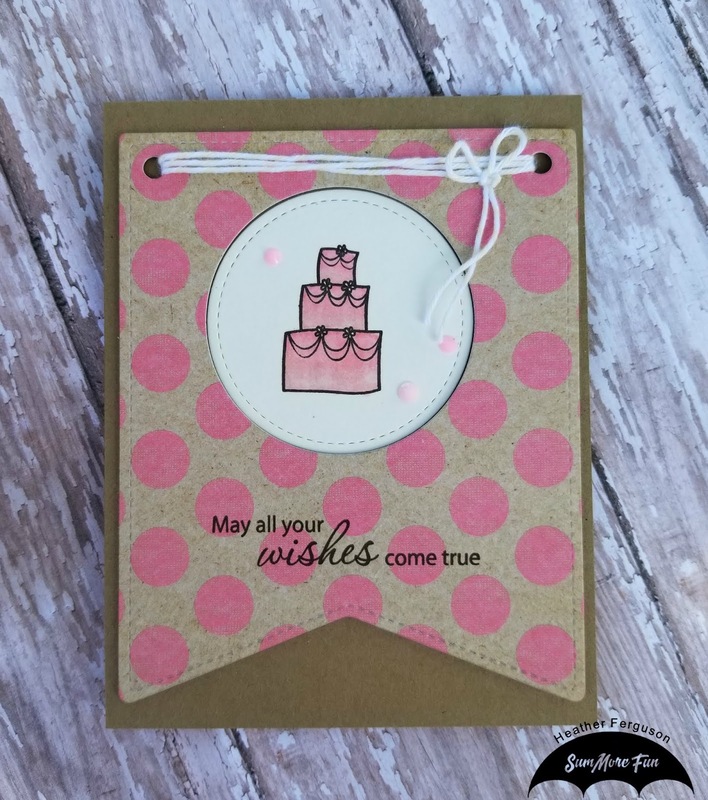 I then placed the circle into the space on the banner flat to the card for some added interest with different dimensions between the banner and the circle. I finished my card off with some pink embellishments. 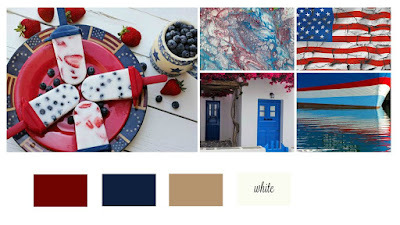 I hope you all had a safe & Happy 4th of July. 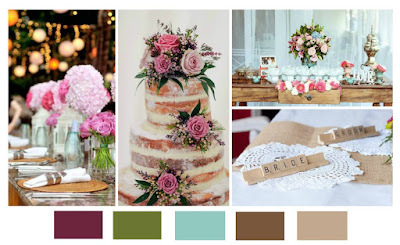 We are back with our newest challenge and I love this mood board, I will link to it below and hope to see you all join us and play along. For my card I started with a Kraft A2 sized card base. I then cut a piece of patterned card stock I had on hand to 2" and applied that direct to the card base at the bottom, with a small strip of the Kraft card base showing. 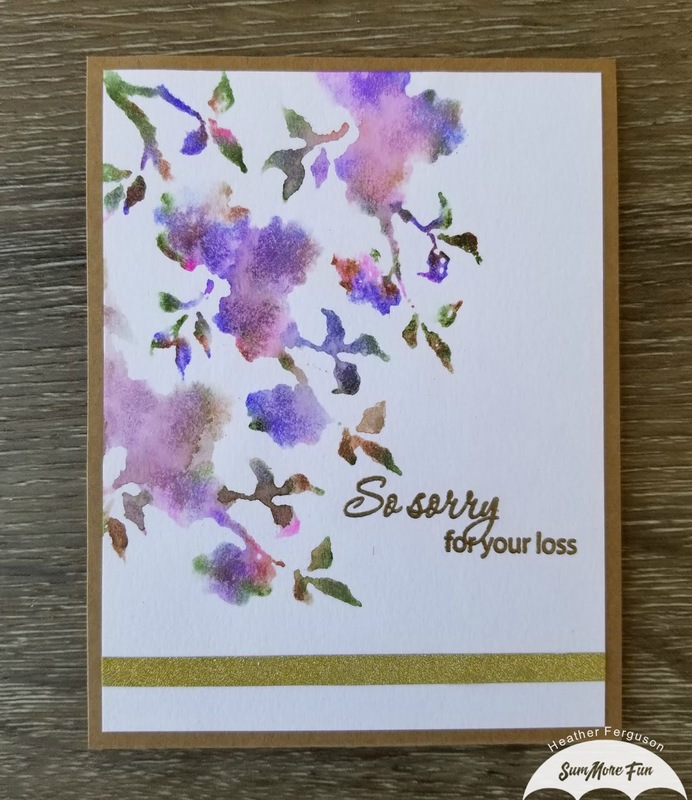 I stamped the sentiment from the Raisin Boat stamp set (Strokes of Pride 10212-Z) onto the lower portion of the white area of the patterned paper. I then cut a piece of white water color paper to 2 1/2"x 5 1/4" and prepped the surface with my anti static powder bag. Using the star stamp from the RB Strokes of Pride stamp set, I stamped the image numerous times with Versamark Ink and then heat set with clear embossing powder. 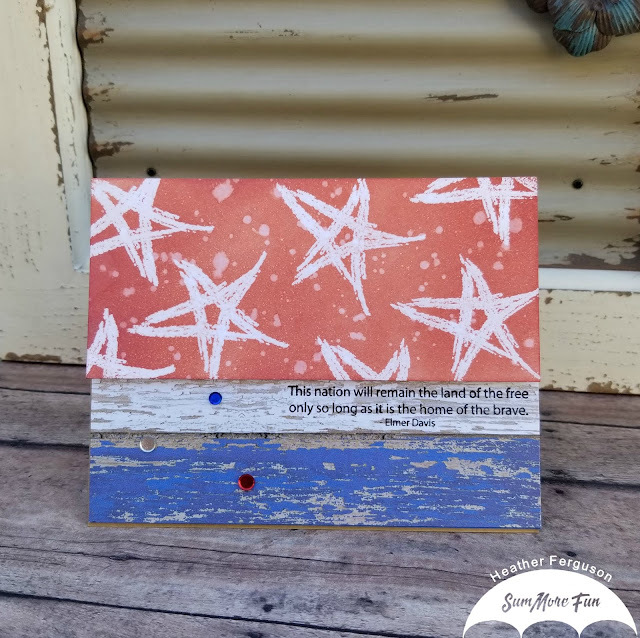 I applied Tim Holtz Distress Oxide Ink in Fired Brick over the panel, and when done I wiped off the stars with a dry paper towel to get the ink off the embossed areas and then flicked clean water onto the panel for some distressing. When my panel was dry I cut a piece of fun foam for the back and applied the fun foam to the panel with some heavy duty double sided tape. I then added my panel to the card base. I finished off the card with some red, clear and blue confetti sequins. 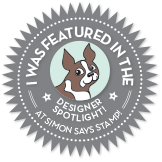 The stamps I used are listed below and if you use code HEATHER10 you will get 10% off your purchase at the shop. Thanks for stopping by, see you all soon!